Civil Services through Chhattisgarh State Services Examination 2017. There are total 26 Cooperative Inspector/Extension Officer Jobs and 36 Deputy Collector Jobs. Candidates with essential eligibility criteria have to submit application forms for CGPSC SSE Cooperative Inspector/Extension Officer, Deputy Collector Jobs is 07-January-2018. Application forms available at www.psc.cg.gov.in CG official website. Candidates applying for CGPSC Cooperative Inspector/Extension Officer Jobs will be selected on the merit basis of Preliminary Examination, Mains Examination and Interview. 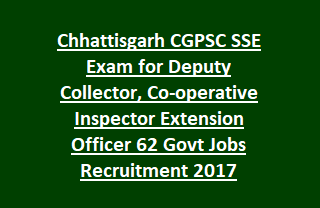 Further CGPSC Cooperative Inspector/Extension Officer, Deputy Collector Recruitment Qualifications, Age details, Pay scale, Application procedure, Selection Process details are mentioned below. CG SSE Mains Examination date: 22/23/24/25-06-2018. Post Name: Co-operative Inspector/ Co-operative Extension Officer: 26 Posts. Post Name: Deputy Collector: 36 Posts. Please visit CGPSC Notification for qualification details. Pay Scale for the post CGPSC Civil Services Deputy Collector Jobs is Rs. 15,600/- to Rs. 39,100/- plus Rs. 5400/- GP. Minimum age limit is 21 years and maximum age limit is 40 years as on 01-01-2017. Selection of candidates for CGPSC Recruitment Deputy Collector, Cooperative Inspector/Extension Officer, Jobs will be held in following stages. Paper I: 100 Questions- 200 marks- Time duration is 2 hrs. Paper II: 100 questions- 200 marks. Time duration is 2 hrs. Willing/ eligible candidates are advised to go through Chhattisgarh PSC official website www.psc.cg.gov.in. Apply for CGPSC Cooperative Inspector/Extension Officer Jobs from 09/December/2017 to 07/January/2018 through online mode. Further Chhattisgarh SSE Exam 2017 Application Procedure details, visit CGPSC official notification.